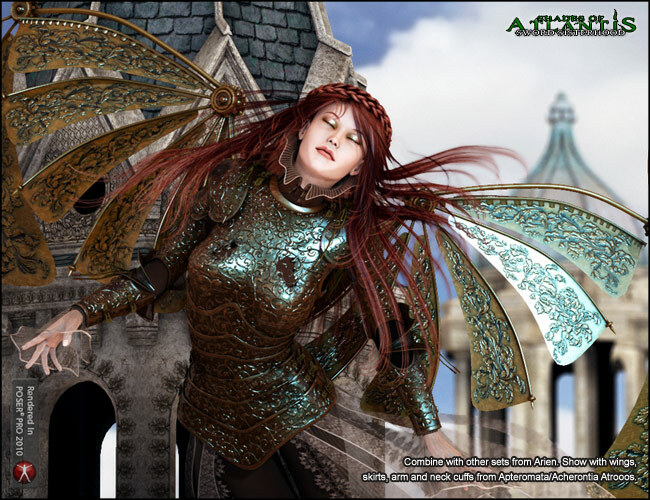 Sword Sisterhood is a texture set for Letterworks's and Arien's Historial Armor for V4. The textures were design to match those of the Brotherhood series for Michael 4, and to mix and match with those from previous Sisterhood releases. 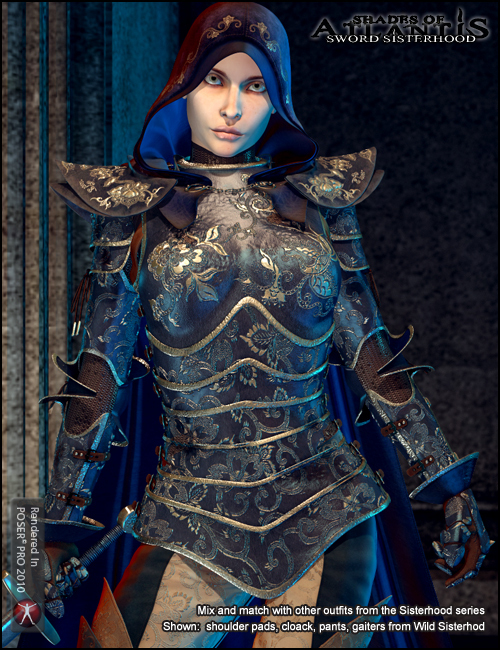 To apply the specific high-end materials for either Poser or DAZ|Studio, go to Runtime\Libraries\Pose\MAT Historical Armor\Sword Sisterhood\, make sure you’ve got your item selected, and then click on the required MAT pose. The Poser materials use advanced shader nodes and displacement, and because of this, require you to render using Firefly, and have displacement enabled. More information at the end of this document. The set provides 10 bodystockings to give Victoria something to go under the armor. To use these, select Victoria 4 and apply the required material. convert the png files in their Runtime\Textures\Arien\sissword\ folders to jpg. Conversion can be done via any image manipulator program, including Photoshop, PaintShopPro, or even free programs like IrfanView or GIMP. Now you will be able to use the new Poser 6 materials, using jpg displacements instead.Be aware that as jpgs only allow for 256 levels of grey, some differences in the rendering are to be expected. IMPORTANT: If you are experiencing problems converting the files, please feel free to contact Arien about this issue. As part of the functionality of Studio, you can find the Studio shaders in the same folder as the Poser shaders; just click on the desired thumbnail and Studio will automatically load the Studio shader instead of the Poser one. Be aware that while every effort was made to get them as close as possible in both Studio and Poser, in some cases we preferred to play on each programs’ strengths, and so the ones depicted in the thumbnails might be slightly different from the ones loaded. For the clothing materials, you will need the Human Surface Shader to be able to use these HSS materials (available with any of the Elite Textures, with Stephanie 4 for free, and separately as ds_ap47), and also that the render times might be longer than standard Studio shaders. All materials were created in Studio 2, making this set usable with Studio 2 and Studio 3. Metals are a big part of this set, and so special care was taken to render them as realistically as possible, while keeping to the aesthetics of the whole series. The metals are set to raytrace, as this provides better effects overall. This means that it is fundamental to have items in the scene to reflect, or else they will not look their best. This also means that when rendering, you must enable raytracing, with a recommended minimum bounce of 2, otherwise the reflections won't work as expected. You can replace the raytraced reflection with a reflection map, but the overall look will not be as good, so you shouldn't do this unless strictly necessary. The metals in this set are not set to raytraced, using instead a custom HDRI image provided with it. This was done as raytracing would cause longer render times. However, it is possible to set them to reflect accurately its surroundings. To do this you will have to go into the Reflection section in the Advanced Surfaces tab, and change the Reflection Mode from “Environment Map” to “Raytraced”. Keep in mind that to look at its best, there has to be something in the scene other than the clothing item and the figure for it to reflect. If you find that you need your metals to have more of a glossy sheen, it is a good idea to give them something light to reflect. Set up a few white or light-coloured primitives outside of the camera view, or even above, so the metals have something to reflect; this should liven them up. This is a trick used quite often for car photography and 3D renders, and should work well for you. Raytraced reflections will make your renders longer, but if you want the metal to reflect less, you can reduce the reflection percentage in your surfaces, or you can go back to the reflection maps settings in the provided materials. higher Pixel Samples settings produce renders where the textures show much better. add Ambient Occlusion to the lighting if you have the processor power to do so, as this will increase realism. Alternatively, you could do a separate AO-only render and composite in Photoshop. Finally, remember that good lighting is essential to obtain good raytraced reflections. If you are using Studio’s or Poser's default lighting, or very low levels of light, or light that doesn’t shine onto the metal, it won’t have the same look as a properly lit scene. It might also be a good idea to include a specular-only light, as it will help improve your renders, in particular if you are using an IBL or GI style of illumination. Also, as mentioned above, make sure that you are using the right level of samples to avoid jaggies, “dirt” or “spots”; if necessary, raised samples and shading rate, both of your lighting figure and in your overall render. UberEnvironment is a perfect companion to the HSS materials. However, be aware that light materials, like pale skin or light shirts, are very sensitive to “spots” and “dirt” caused by the Ambient Occlusion even when using the 4X settings; you can prevent this by using higher Occlusion Samples and Shading Rate. These settings can be changed in the Parameters Tab of the UberEnvironment figure. You can use the included HDRI image in your UberEnvironment to have a light matching the environment reflected on the metal, although it will be very light and might wash out your image if the values are not controlled. enable raytracing if you are using raytraced shadows, ambient occlusion, reflections or refractions; a setting of 1 bounce will suffice if only the former two are used, otherwise use 2-3; this set uses both AO and, raytraced reflections, so the latter will be a better choice. for the displacements to show, displacement needs to be enabled; minimum displacement bounds of 0.020/0.030 are recommended; some of the materials in this set use displacement so enable it when rendering. if you are on P5-6, disable texture filtering, and always set the maximum texture size to the size of your bigger texture; for this product, this value shouldn’t go below 4096px. Reducing this value will result in muddy or blurred renders. If you're using PoserPro7, Poser 8 or PoserPro2010, disable Gamma Correction, or your displacements will not work as intended. can’t find the Studio-specific materials: Studio mats can be found within the same folders as the Poser materials; Studio will recognise them and load them instead of Poser’s. Just select your material as normal. some of the hss materials render all black/all white: make sure that you have the correct HSS version installed; if you are running Studio Advanced 64 bits, you might have to install Studio 32 bits, then re-run the HSS install; you will now have the option to install 32 or 64 bits to different places; install them both as needed; this is a problem that ocurrs sometimes with the HSS installer, and the above should sort it out.